WASHINGTON — Order a rolling photo booth opportunity, complete with karaoke holiday songs, and Lyft will donate the proceeds from your D.C. ride to a local charity. Lyft Merry Mode is available in Washington through Sunday. “The fare that would typically go to Lyft instead is going to Martha’s Table, which is a local community nonprofit that helping children, families and the communities here,” said Lyft mid-Atlantic General Manager Steve Taylor. Props for riders during their ride also include a holiday sweater and Santa hats. 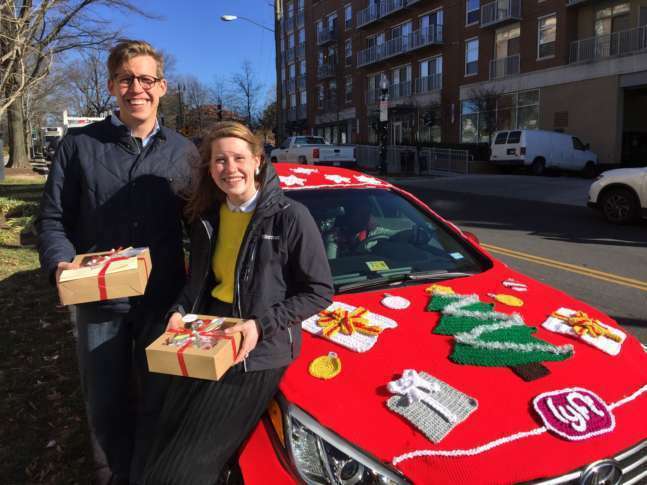 Taylor describes the Merry Mode cars as having been “yarn-bombed” with “ugly sweaters” that took professionals three days to knit, but observers found the results quite lovely when observing the car that visited WTOP. “I’m impressed; I’m very impressed. It’s got a lot of great details,” said Kelly Loggins, of Vienna. “This would make a very warm car,” Justin Johansen, of McLean, said with a laugh about the sweater-wrapped vehicle.